There is no question that Rogue Ales of Oregon is loved by many beer drinkers in the northwest and beyond. They have a large variety of quality offerings that have earned them an overall rating of 93 on Beer Advocate and have recently added the Rogue Farms banner for which they grow their own hops. It is hard to believe one could use a word as strong as HATE to describe any of their brews. Enter VooDoo Doughnut Bacon Maple Ale. If allowed to summarize this brew in only one word, I would have to go with “vile.” I will say without hesitation that I would downright admire Rogue for taking such a risk if it was some failed experiment that caused them to go back to the drawing board. Perhaps that is partially the genesis of their follow-up VooDoo Doughnut Chocolate Peanut Butter Banana Ale, which we will be trying soon. However, the problem with this beer is that, despite it being a trainwreck of overpowering unpleasant flavors, it was mass produced. This buyer beware column is designed to protect the drinking public from bad beer and with this brew the wheels have really come off the wagon. Still, this stuff sells, so for the first time I enlisted a tasting committee of sorts, a group of beer-loving co-workers willing to give it a try. I wanted to be sure that this beer was in fact as bad as I remembered and that my taste buds weren’t involved in some horrible accident. It is understandable that one might want to experiment with maple. The word takes me back to childhood memories in New Hampshire. Miles of tubing would be run along roadside maple trees each fall. They would lead to large collecting tanks, which would then be driven to sugar shacks on local farms. I have tasted it before and after being cooked down. Needless to say, New England produces the best Maple products available, so it is with great apprehension that I approach anything that uses maple flavor as a novelty. 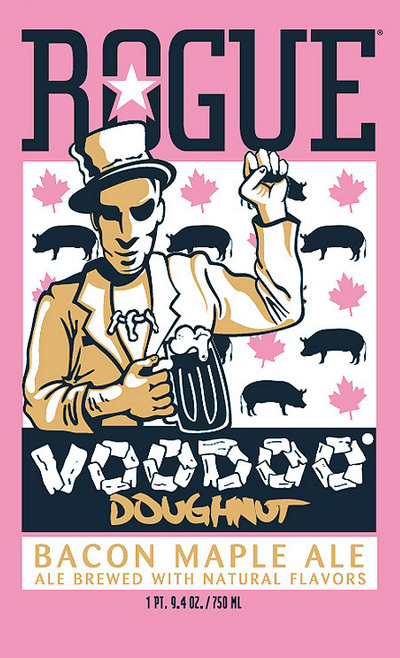 The beer is based on an actual doughnut from the locally famous Voodoo Doughnut chain of Portland, OR. I have not sampled their wares, but they do in fact look both comical and delicious. However, the fact that these donuts are popular doesn’t automatically warrant a craft brew based around them. Alcohol is derived from sugar, but that’s no reason to go cramming every sugary item one encounters into a brew. I find it a little unsettling that the bottle has been painted the exact color pink as Pepto-Bismol. After this, my second tasting of Bacon Maple Ale, I would sooner drink an entire pint of that than crack another of these beers. The aftertaste would be downright refreshing by comparison. I crack the bottle with a group of about six people ready to help profile this uniquely bad beer. The initial aroma straight from the bottle is not bad, it’s just not beer. No hop, no malt, no yeast, just pure unadulterated donut. The Maple frosted kind of course, but here I don’t quite detect the bacon. The pour itself looks good. Amber and golden tones capped by two fingers of billowy head that carries decent lace to the bottom of the glass. The carbonation looks inviting and even up until this point the brew seems like it could be good. Then I taste it and all of the reasons I knew this beer had to be reviewed come rushing back to me. An over-the-top smokey bacon is front and center, but is quite like a burnt piece that was ignored on the stove top for far too long. It is not smoky in the sense that is coveted by many brewers, but in the sense that all the doors and windows of the house need to be opened to prevent the stench from permeating the drapes. It is a burnt flavor that never stops. I take another sip. There is no refuge from the sweetness of the maple frosting flavor or the napalmed bacon. I line up several small samples for my cohorts. After my initial reaction of “Oh God ” they all approach the beer with caution. My employer Eric is first to offer his review. “Well, it’s not terrible. It’s beer.” I find his view on the beer shifts over the course of the tasting as he remarks that it is the aftertaste that is terrible. Another taster, Adam, makes a prolonged face with a deep smile. I truly think he has trouble forming words to associate what is happening in his mouth with any kind of certainty. After a long moment that makes me laugh he offers, “Gym socks with syrup.” He digs back in like a trooper, gives it a fair second chance, then decides “It doesn’t improve with subsequent tastes.” The next time I see him, after this is over, there is a bottle of Glenlivet in his hand. He ran to scotch with reckless abandon, desperate to burn away this experience. Another co-worker, Ben, offers a similar reaction. One that takes several puzzling moments to articulate. “It’s almost indescribable. It’s like… bad chaulk.” That sounds unlike any beer review I have heard, but as I sip further I look for this and it is surely there. Ed “Darth Hater” Velasco proves an image is worth 1,000 words. Suddenly, all the phones come out. I find that all of my committee members are going out of their way to text warnings to friends. They tell them never to buy this beer. They tell them to stay away. Several of them thank me sarcastically as they try to process what has just happened to them. I find that half way through the bottle people have abandoned me. They can go no further. Committed to getting the full profile, I force myself to refill my glass. There is a moment as the beer warms when it demonstrates some new flavors. Warmer, more palatable bacon notes accented by bitter rind. The beer has flattened out, making it smoother, but allowing those unpleasant flavors to make the final sips nearly undrinkable. The end result is a taste like burnt breakfast with an overly dry finish that offers no relief. It is here that I begin to experience something wholly new to me in beer tasting. The flavor of the beer has crept into my sinus and the result, for lack of an easier way to say this, is like bile. My nose feels like I am fresh from throwing up a night of heavy drinking. I watch as my committee of tasters fight over a can of mints. They quickly pool money and finance a trip to the convenience store, demanding some other beer to push this off of their taste buds. I have to hand it to Rogue in that they have created what I will call an “event beer.” When you say Bacon Maple Ale, people seem to unanimously say, “that sounds weird” followed immediately by “I gotta try that.” The fact that this beer is awful hasn’t stopped them from selling a whole ton of it I am sure. It is tantamount to trying the hottest pepper, or the ritual of drinking absinthe for the first time. I know that they aren’t shy about gimmicks. For beer lovers far crazier than myself, there is a brew in the works that will be made with yeast cultivated from head brewer John Maier’s beard. You won’t find a review of that beer with my name on it, as I think it crosses the line of decency, but back to Bacon Maple Ale. What Rogue has here is a beer so bad, people will go out of their way to buy it and make people try it, even at the bloated $12.99 price point. I guess if they are in it for the money they may very well have a hit on their hands. I however feel a company known for craft brewing should hold themselves to a higher standard. Many of you are going to try this beer anyway. Like Pandora’s box you just have to know what’s inside. That’s fine, just don’t say I didn’t warn you. 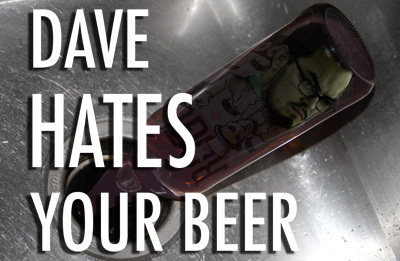 This entry was posted in Dave Hates Your Beer. Bookmark the permalink. Thanks for letting me know what my baby girl is up to these days! 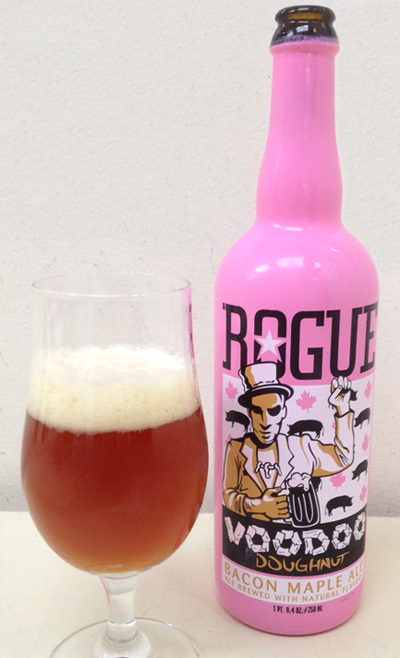 I’m not a big fan of Rogue anyway, but this beer is gawd awful and an embarrassment to the entire region. It was even featured on “Chopped” as a basket ingredient and the chefs hated it. I do LOVE the actual donut, however. 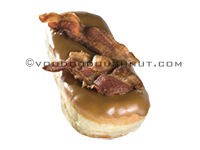 Nickel Diner down here in LA makes a mean maple bacon donut, but I have yet to try Voodoo so I’m not sure which is better. Nobody wins with this beer though. I know Ed isn’t blessed with beer knowledge and appreciation like I am. In fact, I know for a fact that he’s had beer enough to count in only two hands. However, bacon and maple are things I know he hold to be Holy in every sense of the word. For him to make such grimace of this experience is almost apocalyptic. I am familiar with smoked beers, so when I read the name I pictured something along the lines of a rauchbier, with maybe a little maple adjunct of sorts. I even forgive the Barbie colored bottle, which I attribute to that all-familiar pink boxes that house fresh, warm donuts. This blog makes me afraid. Do I dare to try? Sadly it is one of those beers you have to try to believe. It is a gimmick for sure. It’s hard to evaluate against any style. There is nothing “adjunct” to anything one can appreciate. It is all front and center and way overdone. It is really fun handing it to people like your brother though, just to watch a traffic accident of taste unfold on somebody’s expression.